Cloned from LCD Dot Matrix HD44780U by Håvar Henriksen (farside), 5x8 LCD HD44780U A02 by vader381, LCD Dot Matrix Condensed by Håvar Henriksen (farside), LCD Dot Matrix by Håvar Henriksen (farside). This is to be used together with my LCD Dot Matrix HD44780U font. Info: Created on 22nd April 2011 . Last edited on 22nd April 2011. 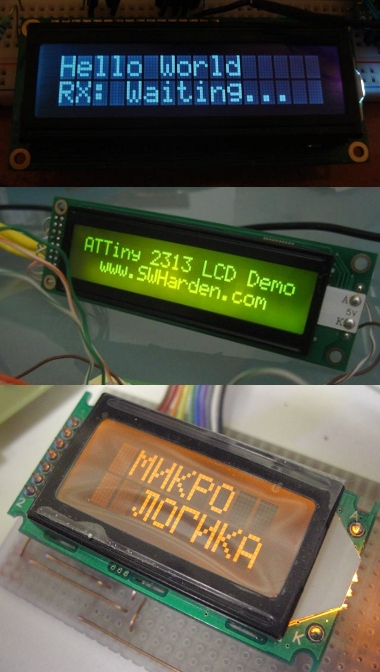 Some real world examples of the HD44780 LCD. Congratulations! FontStruct Staff have deemed your FontStruction worthy of special mention. “LCD Dot Matrix HD44780U symbols” is now a Top Pick. @meek: Wow, thank you! :-) My first Top Pick. 6. For each submission, you must post at least one sample image in the comments of the FontStruction. @meek: Sorry, I've mixed two concepts, all's right! 10/10! Good font! And it completes my font, "écran monochrome/monochrome display"!